Nintendo Land was first met with puzzled reactions not only when Nintendo unveiled the game at E3, but also made it a headlining feature, this summer. All people knew was that Nintendo Land was going to be what Wii Sports ended up being for the Wii, a true testament for what the console can do and what it's all about. And after two weeks into the Wii U's release, it's safe to say that the console is going to have an enticing future in terms of gameplay. Set in a theme park atmosphere, Nintendo Land is sort of a tribute to the publisher's 30 years of gaming innovation. The game boasts 12 minigames, or attractions as Nintendo wants to call them, that each feature various aspects of what makes playing on the Wii U a unique experience. Much like the way Wii Sports revolutionized motion-based gameplay, Nintendo Land is another attempt at offering old and new gamers fresh ways to play. By branding each of the attractions with a popular Nintendo character or series, the developers have succeeded in making the attractions accessible to both casual and core gamers. The minigames themselves are simple to play, but they also feature enough of a challenge to keep more seasoned players interested What follows is a brief description of each attraction. SOLO ATTRACTIONS: Of the 12 minigames featured in Nintendo Land, half of them are solo attractions that are obviously played alone, and they're actually quite entertaining. In Yoshi's Fruit Cart, the player has to pay close attention to both the TV and the GamePad. The object of the game is to get from the entrance to the exit by drawing a line on the GamePad, but in order to unlock the exit, the player has to eat every fruit on the screen. The catch here is the fruit isn't visible on the GamePad, so close attention to detail is required with the lines being drawn. The game is easy at first, but it increases in challenge when fruit can only be eaten in specific order, they start to move, and hazards start to appear on the screen. Featuring the Game & Watch octopus, Octopus Dance is pretty much "Simon Says" using the GamePad. 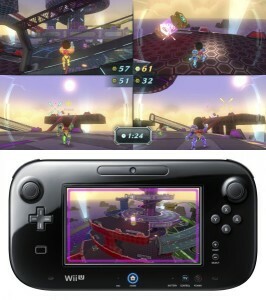 Players use the left and right analog sticks to copy the underwater dance instructor's moves in rhythm. The game gets progressively harder when the tempo increases and the game starts requiring players to shake their controller and skip beats, not to mention the squids that'll ink up your GamePad screen, forcing players to look at the TV to see a move. Crash Course is probably the hardest single-player minigame featured in Nintendo Land. Based on the original Donkey Kong Game in the arcade, the player has to navigate a 2D plain with all sorts of hazards in order to meet up with Princess Pauline. The game is primarily played by tilting the GamePad left and right, while some buttons move platforms, the analog stick operates cranks, and the mic can be blown to pull elevators. Takamaru's Ninja Castle is the final product in what was probably the most popular Wii U tech demo in its days in development. By turning the Wii U on its side and aiming at the TV, players can shoot shurikens and other deadly objects at ninjas simply by sliding their finger or stylus from the GamePad toward the TV. The game is essentially Duck Hunt with a cursor on the screen and bosses to fight at the end of each level. Based on F-Zero, Captain Falcon's Twister Race is simply a race against time. 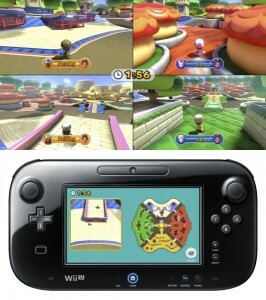 The game is played by turning the GamePad on its side and using it to steer through a race course filled with boosts and various hazards. The game only suffers because the player will spend so much time focusing on the GamePad that he or she won't see what's going on in the TV screen. It's a waste of good graphics. Based on Balloon Trip, Balloon Trip Breeze is probably the one game in this compilation that feels like another entry in its respective series. Players guide the ballooner simply by sliding their finger or stylus on the touch screen to guide the ballooner through the sky, avoiding enemies and other hazards in the air in an attempt to land safely on an island in need. COMPETITIVE ATTRACTIONS: In addition to the game's 6 multiplayer games, half of them are competitive ones. They're a blast to play and easy to understand. Like the name says, Mario Chase is all about chasing Mario. The player with the GamePad is Mario and has to run around the course for two minutes avoiding all the Toads, and that person has a complete bird's eye view of the area. The Toads, being operated using Wii remotes, don't have that luxury, and have to work together to catch Mario. As a result, some loud communication will be had in the living room playing this game. At the end, a quick replay of the diagram is shown to see how Mario escaped or got caught. 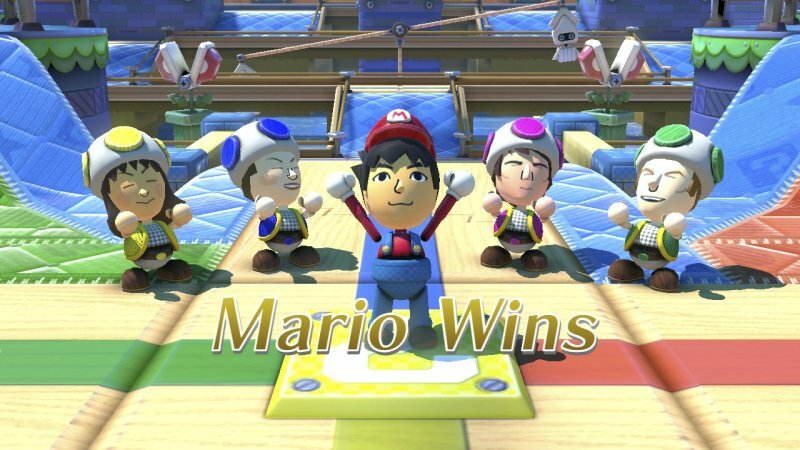 Mario Chase is probably the most simple competitive game in the package, but it's also likely to cause the most commotion with a group of friends. In Luigi's Ghost Mansion, the players with the Wii remotes have to kill a ghost (the person operating the GamePad) by shining their flashlights on it. The catch is that the ghost is nowhere to be seen, but when it's nearby, the Wii remotes will give off a rumble that gets more intense the closer the ghost is. The game ends when the ghost is killed, or the ghost captures his predators. It's kind of like Pac-Man, but there's no eating involved. Animal Crossing: Sweet Day is another game of cat-and-mouse between the players with Wii remotes and the player with the GamePad. 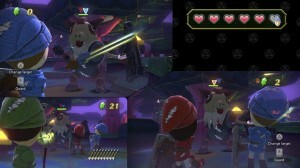 The object of the game for the players with the Wii Remotes is to fill their various home bases with a certain quota of candy, while the the person with the GamePad acts as the police and has to stop the smugglers at least 3 times to win. TEAM ATTRACTIONS: The rest of the multiplayer games are team-based and feature ideas that are most like the respective games each attraction comes from. This Zelda themed minigame is pretty much an on-rails adventure. The players with Wii Remotes and Nunchucks all have swords, while the person with the GamePad has the bow and arrow. Aside from just hacking and slashing, there are puzzles to solve … by hacking and slashing. Taking a page out of Skyward Sword, players with the sword are treated to full MotionPlus controls and holding the sword up for a short amount of time unleashes a beam of light to come out of the sword when in combat. In Pikmin Adventure, the Pikmin (controlled by using Wii remotes) help Captain Olimar (GamePad) by opening up paths and killing bugs like they do in any other Pikmin game, complete with a boss at the end of the stage. There's also a versus mode where Pikmin and Olimar compete for candy. Metroid Blast is probably the most challenging yet polished attraction in Nintendo Land. The player with the GamePad gets to operate Samus' airship, which actually has quite a learning curve due to it making use of the GamePad's gyrosensor and combination of different buttons to navigate each course. It actually feels like the flying units from the Halo games, just without the motion sensing capabilities. Everybody else with Wii remotes dress up in Samus' power suits and wreaks havoc from there in third-person shooting action. There are three modes of play: Assault Mission, Surface-Air Combat, and Ground Battle. In Assault Mission, players work together to rid the screen of enemies. Surface-Air Combat is sort of a one-sided bout where the object of the game is to shoot the heck out of the airship, while Ground Battle is pretty much a multiplayer coin rush mode where everybody has to fight on foot. There are a variety of reasons why one would want to buy a Wii U, but one of the main reasons to owning one is seeing what exactly the system does differently. 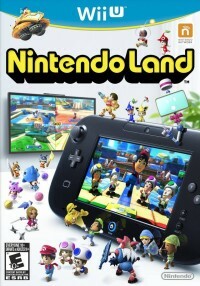 Nintendo Land is the one launch game that shows exactly what the system is currently capable of and also gives players an idea of what to expect in the future. With support of up to 5 players and fresh experiences each attraction offers both as a multiplayer game and a standalone title, Nintendo Land is a game that will demand attention and is definitely worth the price of admission. Of course, the lucky players that own a Wii U Deluxe Set won't even have to worry, because the game already comes bundled with the console.